Yamaha Marine has recently launched its new V8 XTO Offshore and it will make its European debut at the next edition of the Genoa International Boat Show. With 5.6 litres of torque and thrust – and 425 horsepower – it is a fully integrated power system creating a new class of extreme offshore performance and control, particularly when teamed with Yamaha’s latest generation Helmmaster® integrated boat control system with its CL7™ display. The new V8 XTO Offshore features massive power and thrust, unmatched toughness and reliability, unprecedented system integration and precision control, along with ultimate convenience and customer care. It is the successful result of the longstanding experience and the innovative approach of Yamaha Marine, which rethought the concept of the outboard and its related systems by applying new technologies to the industry. The XTO Offshore is the first 4- stroke in the industry to use Direct Injection. The high-pressure injection of fuel directly into the combustion chamber greatly improves atomization and increases the effectiveness of the fuel burn for maximum power and efficiency. Combined with massively rugged gear cases and the toughest powerheads ever made, this feature makes the V8 XTO Offshore capable to drive very large propellers. The advanced Direct Injection system features five fuel pumps and generates injection pressure up to 200 Bar. The three-stage fuel pressure system also features two independent fuel pumps that activate at specific, individual RPM levels within a Vapor Separator Tank (VST). This ensures unprecedented high-precision fuel flow and delivery, even at max RPM. Yamaha’s V8 XTO Offshore also boasts an incredible compression ratio of 12.2:1. The In-Bank™ Exhaust feature gives the gas a direct route to the lower unit and out via the centre of the propeller hub, improving the flow. The V8 XTO has a unique two-stage water pump and a dual chamber oil pump, each designed for consistent operation at high RPM. The water pump features a massive rubber impeller for high pressure, along with a super-tough steel impeller. Together, they provide high volume cooling water flow and accurate temperature control at all RPM levels, even under the most extreme offshore conditions. In addition to an oversized gearcase, hardened gears, a robust, offshore bracket and super-strength motor mounts, the V8 XTO also features plasma fusion technology for the cylinder liners, not only for durability but also for a more compact engine. The micro-textured surface is 60 per cent harder than steel and significantly lighter, allowing us to create a greater engine capacity without increasing the dimensions of the powerhead. The lower surface friction also helps to maximise fuel economy. Dual overhead, endurance-driven camshafts on each cylinder bank are connected via a self-tensioning chain immersed in an oil bath for accurate valve timing and long life, while carbon-coated valve lifters also increase durability, delivering quiet and precise connection for consistent timing. Another ‘Industry First’ for the V8 XTO is its fully integrated electric steering system, the first of its kind on any outboard. It has no hydraulic lines or linkages, so it responds more quickly and smoothly than conventional systems. In addition, it allows for cleaner rigging and an orderly bilge area. Of course, the ultimate control solution is to team the V8 XTO with Yamaha’s unique and hugely successful Helmmaster® fully integrated boat control system, with its revolutionary joystick-controlled docking facilities and outstanding CL7™ colour display. The special new XTO OS™ propellers are made to complement the huge torque potential of the Yamaha V8 XTO Offshore. These new props produce more thrust in both forward and reverse, using diameters from 16 to 17⅛ inches. The latest blade design, with its huge surface area, moves the very biggest boats with less effort and more control. Thanks to the new exhaust-gas relief system, these propellers have yet another advantage; they ‘bite’ clean water in reverse, which helps yield reverse thrust up to three times that developed by Yamaha’s F350 … and that means easier manoeuvring and control when docking. With the V8 XTO you need go no further than the dock for a lower unit service, thanks to our unique gearcase lubricant exchange system that allows this to be done without the boat leaving the water. The V8 XTO Offshore also has great charging capabilities, providing up to 90 amps of total (gross) power. 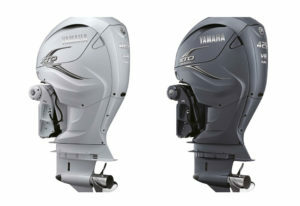 The new V8 XTO Offshore is available in a Pearlescent White colour scheme, as well as the classic Yamaha Grey.